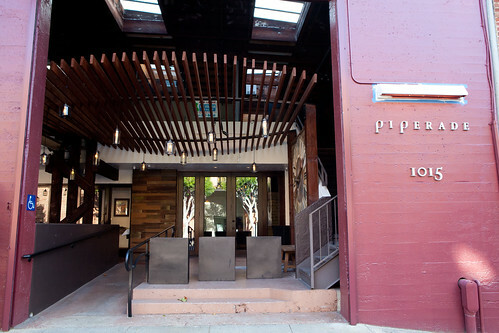 Piperade is a rustic, comfortable, California-Basque restaurant that I would go out to eat on a weekly basis, if I were to live in San Francisco. 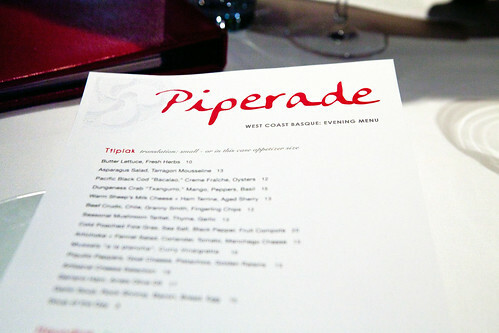 It’s satisfying food that isn’t too fussy or complex and has a good value compared to other San Francisco restaurants. 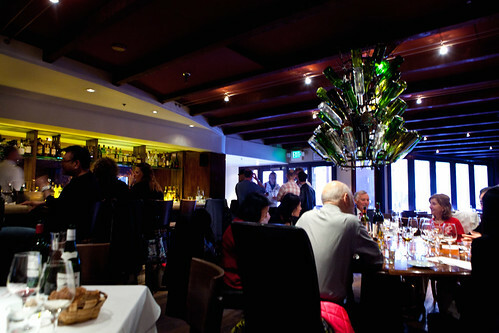 We had a glass of crisp, quaffable Viña Cartín Albariño 2010 ($10 per glass) to go with our appetizers. 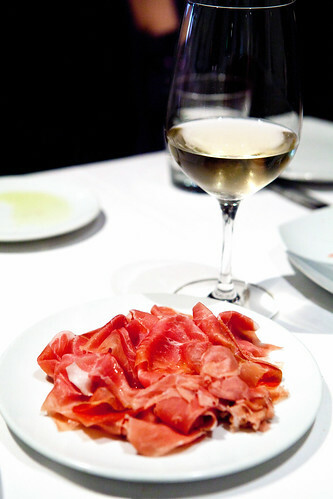 The paper-thin sliced serrano ham ($17) drizzled in Arrels olive oil was tasty. It’s smooth and has a subtle sweet and lingering after-taste with a touch of nuttiness. 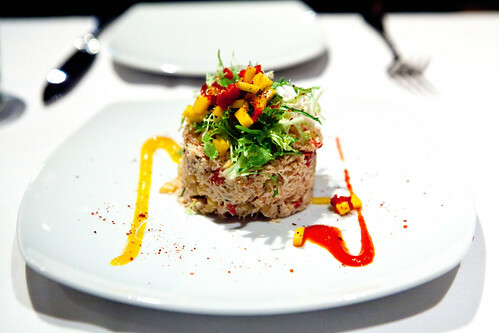 The “Txangurro”, Dungeness crab ($15) was essentially a crab salad with a mango and red pepper sauce. It’s a good salad that contains a lot of crab meat but it’s missing an ingredient or flavor to make it amazing. 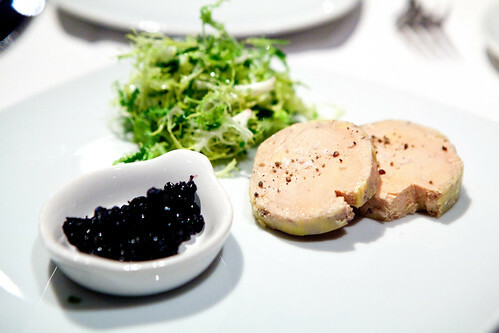 The cold foie gras plated with huckleberry compote and greens was simple and delicious. 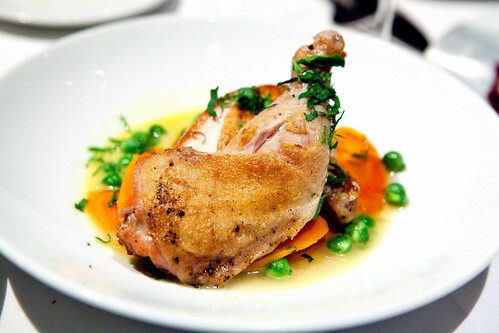 Our main courses with roasted cornish hen ($23), sitting on a bed of peas and carrots with a chiffonade of mint was comforting. The bird was moist, juxtaposed to the crispy, golden brown skin. The sweet spring vegetables and hint of mint worked well. 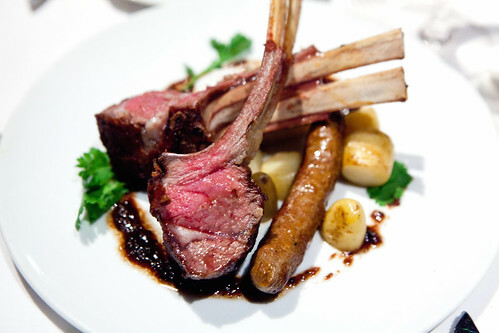 The roasted rack of lamb, merguez, cumin-date relish, braised fennel ($30) was fantastic. The lamb was a perfectly juicy, medium-rare and was sublime with the date-cumin relish and sweet fennel. The merguez was very mild in harissa but it didn’t compete with the lovely ribs. 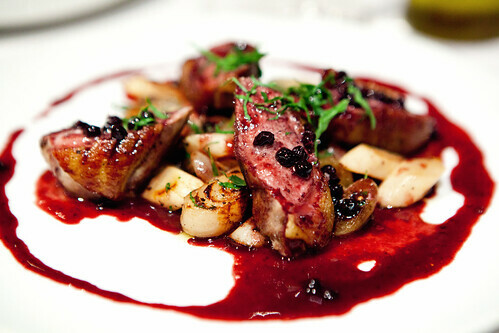 The seared duck filet, sautéed salsify, cippolini onion, huckleberry ($28) was the favorite dish of the evening. Cooked to a lovely rosy-red and the sweet-savory flavors of the caramelized onions and huckleberry worked wonders. 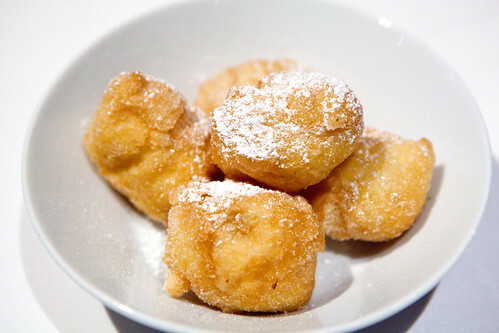 The orange blossom beignets ($8) were piping hot, as they were made to order. Crisp, light and fluffy with covered in a delicate glaze of orange blossom. 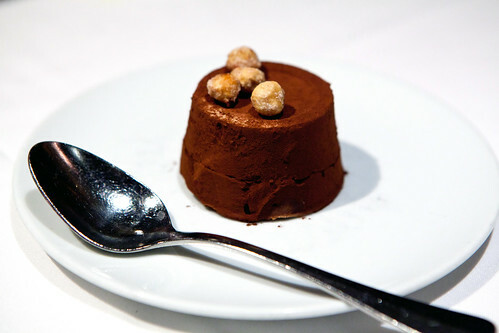 The turron mousse cake ($8) reminds me of a Rocher chocolate candy in a frozen mousse cake form. 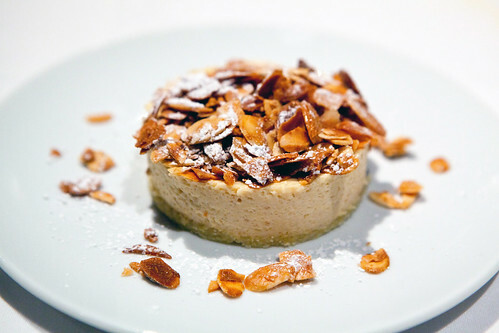 The crisp, almond base meets the turron flavored mousse, covered in cocoa powder and topped with toasted hazelnuts. The Gâteau Basque ($8) was a sponge cake, layered in pastry cream and topped with a layer of cherry preserves with a healthy helping of toasted flaked almonds.